CAPSULE REVIEW: Stacy’s first burst onto the scene in 1997 with Pita Chips—an original, tasty cracker alternative and crunchy snack that propelled the small company into national prominence. Now, Stacy’s given the bagel the same treatment as the pita: bite-size chips, baked, not fried, in a variety of flavors that can be served with soups, dips, or eaten from the bag as a healthier alternative to other salty snacks. 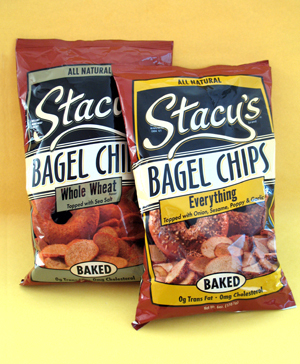 Stacy’s Bagel Chips are a hard-working little multi-tasker: crunchy bites that can be enjoyed with a variety of foods as a cracker, or straight from the bag (or, more civilly, from a bowl) as a snack. Unlike large bagel chips that are sliced horizontally with a hole in the middle, these mini-chips are cut vertically, from the hole to the outer edge of the bagel, creating a much smaller but hole-free chip. *Total fat 4g, total carbohydrate 19g, sugars 2g, sodium 260 mg.
All of the flavors are equally tasty, depending on what you’re in the mood for. 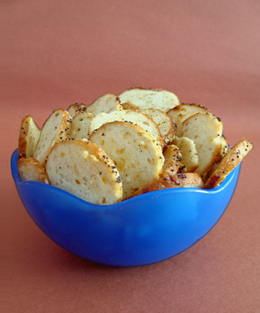 If you tend not to add salt to your foods and are looking at the bagel chips as a substitute for toasted [bland] bagels, the flavor profile may seem a bit salty at first. But it’s a quick adjustment in both palate and perspective: these aren’t bagels but bagel chips, a salted cracker and snack alternative. munching than other crunchy snacks. The company website has a fun Recipe Generator: You check off what ingredients you have at hand (or enjoy eating)—spices, meats, vegetables, condiments, pretty much the whole supermarket—and it comes up with spreads, dips and other foods that go with the Bagel Chips. At retailers nationwide, including BJ’s Wholesale Club, Costco, Kroger, Publix, Roche Brothers, Safeway, Shaw’s, Stop & Shop, Wild Oats, Whole Foods, and Whole Foods Market. Available online at Amazon.com and GiveMeFood.com. For more information visit StacysSnacks.com or telephone 1.866.4-STACYS. Prices and flavor availability are verified at publication but are subject to change.